Teaching Blog Round Up: Document, Document, Document! : RtI and Google Forms! Document, Document, Document! : RtI and Google Forms! Happy Friday! It's Angie from The First Grade Scoop here. We've just finished our third week of school and things are busy, as expected! I've spent the past 14 days of school trying to get to know my students, help them get to know one another, and determine what they do well and what they need to work on so I can help them grow the best I can. Our school uses RtI to help provide intervention for our students, and I always feel like I'm not 100% sure of how to best document my students' needs, particularly for those students who need behavior plans. I know I'm definitely still learning when it comes to how to best meet my students' needs and to document interventions to get them appropriate support. I was talking about concerns I have about one of my students with an AMAZING teacher I work with, and she suggested using a Google form to help track this student's behavior. She described what she did, I set it up... And already, it's been amazing! I hadn't made a Google form for ANYTHING before, and I was still able to get the form I needed up and running in about 15 minutes. I obviously am not sharing the form with others to keep the child's information confidential, but I can easily access the form as needed to record my anecdotal notes. 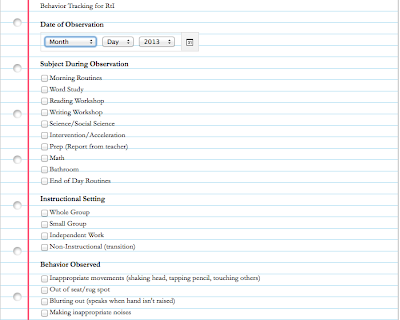 I tried to think of the big things I'd need to document for each behavior I wanted to record... Date, subject during which the behavior occurred, the setting (whole group, small group, independent work, or non-instructional, such as a bathroom break or other transition), what he did, my response, and his response to my redirection. He's also been struggling to answer a question appropriately, so I thought I should record this. There's also an option on the Google form to add a text box response, so I can quickly type a few notes. Obviously, I can't do this in the middle of a mini-lesson, but I've kept a pad of Post-Its to make a quick note until I can get to the computer and record the incident. 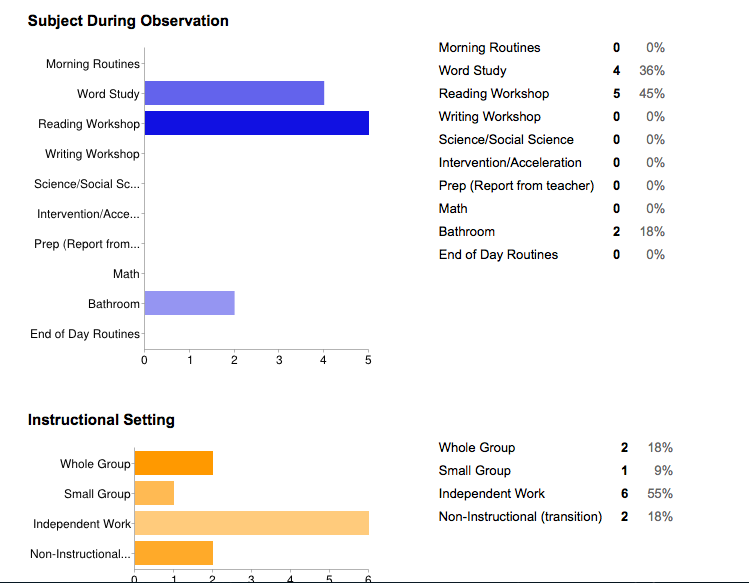 The amazing thing about this form is the ability to track percentages... And data for RtI is a biggie! 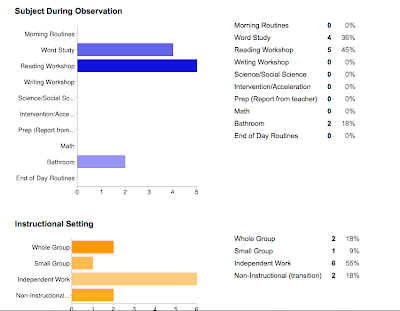 By viewing the responses in graph form, I can see when behaviors tend to occur, and patterns in the data quickly and easily. 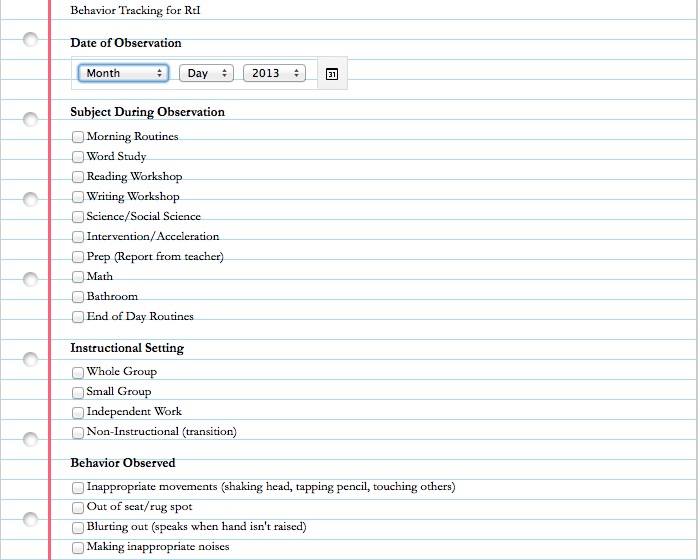 This is still very much in the early stages, and I'm already finding ways I can edit the form, such as adding in a space to record positive behaviors. But I'm excited to try this out not only with behavior documentation, but academic interventions and assessments as well. I hope this might be helpful for you and your students! Enjoy your weekend!!! This is amazing! Do you think you could save a blank copy without student info and share it on Google Docs? This would be so helpful.